Today SolidWorks unveiled an eDrawings app for the iPad. The app costs $1.99, is 26 MB large and can be be downloaded here. I bought the app today and installed it on my first generation iPad. 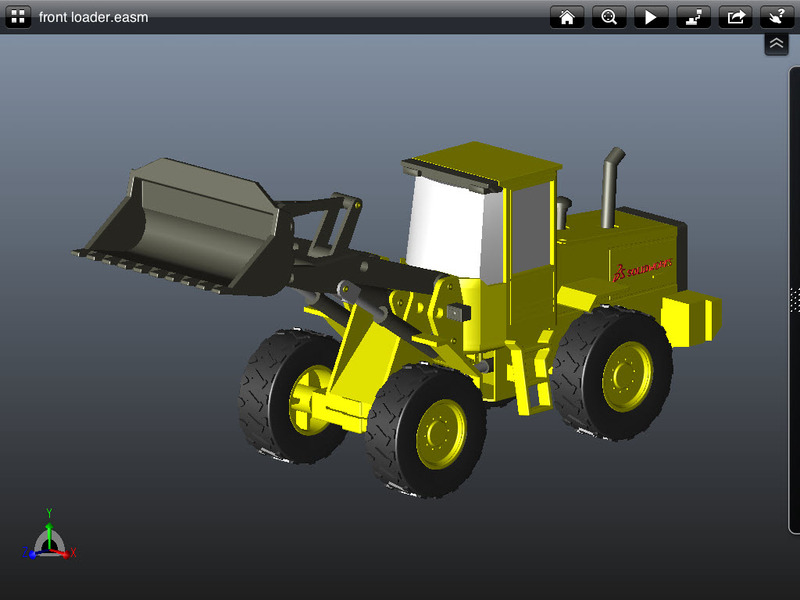 The app comes with a few sample 3D models and 2D drawings and I got a rude shock when I saw this as I tried to open the first sample model – the tractor. I killed all other apps running on the iPad, restarted the eDrawings app and all was well. It seems to be a decent first version and has the standard orbit, zoom and pan navigation features. You can learn all about those and more in this introductory video. The one feature that I would like to see in a future version of the app is the ability to section a 3D model and move the section plane with the finger so that I can inspect the innards of a 3D model in real time. Viewing the external features of the model is nice. But there is no way of seeing what’s inside. There is no way to set object transparency either. The ability to turn the visibility of parts on and off would be helpful as well. The other thing I would like to see, and frankly which should have been part of this first version, is the ability to view part properties. There is a panel containing the part structure and that’s about it. Even that doesn’t do a very good job. 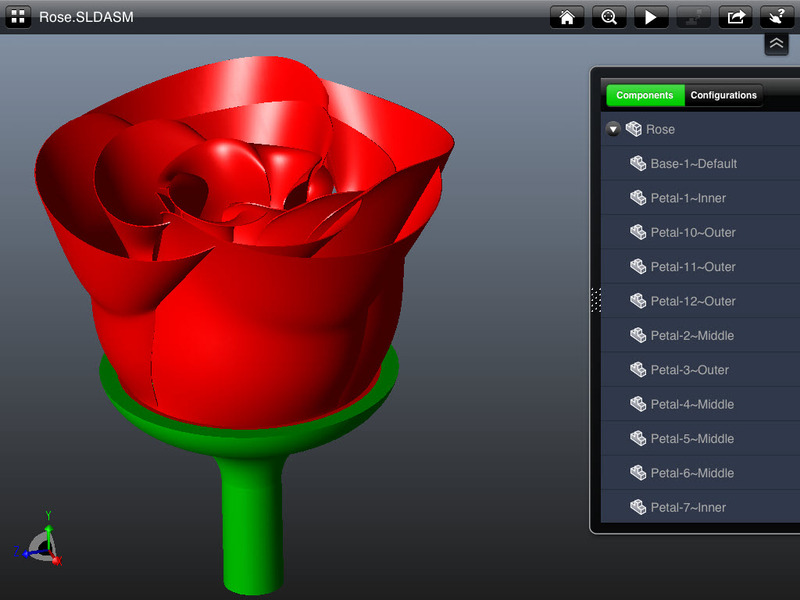 For example, this is what the structure of my rose assembly looks like in SolidWorks. Just four parts. But when I open this in eDrawings for iPad the structure comes up exploded. Which is rather annoying since it sends a wrong message to the person viewing my model. It appears that each petal in my rose is its own individual part, which is not true. I leave it up to you to imagine what a far more complex assembly with many part patterns will look like. I noticed something else. When you click the iPad home button or pinch swipe 4 fingers to push the app into the background and work with another app, eDrawings actually unloads the currently loaded model. This is not normal iOS behavior and is actually a pain because when you return back to eDrawings, you need to load the model again and wait for it to show up. Ironically, the 3D VIA Mobile app by Dassault Systemes, like most iOS apps I’ve used, doesn’t do this. You can push 3D VIA Mobile into the background, work on an email or something, come back to it and your model will be still there waiting for you. This leads me to wonder whether SolidWorks programmers leveraged the 3D mobile viewing technology already developed by their counterparts in parent Dassault Systemes. I get the feeling that eDrawings for iPad is a separate code base altogether. ← Real Star Trek Replicator?